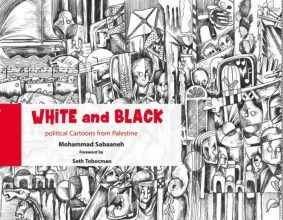 Join Just World Educational at the official launch event for Mohammad Sabaaneh’s much-lauded book White and Black: Political Cartoons from Palestine (Just World Books, 2017). Sabaaneh will share some of his art and discuss his work as a cartoonist in Palestine and the ways in which his time as a political prisoner in an Israeli prison have influenced his art. While showing slides of his cartoons he will explain his artistic influences, why he sees editorial cartooning as a form of political activism, and how he navigates the challenges of his trade in Palestine. Sabaaneh is a Palestinian graphic artist based in Ramallah in the West Bank. He is the principal political cartoonist for Al-Hayat al-Jadida, the Palestinian Authority’s daily newspaper, and has published his work in many other newspapers around the Arab World. He is a member of the International Cartoon Movement, Cartoonists Rights Network Internationa, as well as the VJ Movement connecting visual journalists across the globe. Sabaaneh’s work has been displayed in numerous collections and fairs in Europe, the United States, and the Middle East. Copies of White and Black will be available for purchase and signing.